The NBA's hottest team paid a visit to Moda Center Sunday night, and the Trail Blazers did nothing to cool them off. The Utah Jazz didn't seem to miss injured point guard Ricky Rubio at all, blowing open a tight game by outscoring Portland 38-19 in the third quarter en route to a 115-96 victory. 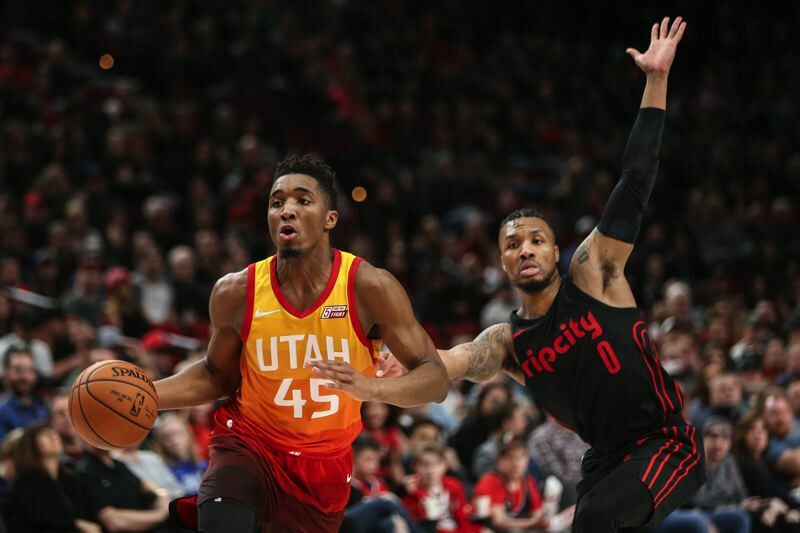 It was the ninth straight win for the Jazz (28-28), who ended Portland's nine-game home win streak and drew within 2 1/2 games of the Blazers (31-26) in the crowded Western Conference playoff race. Portland is in sixth place, one game behind No. 5 Oklahoma City (32-25), a half-game ahead of No. 7 Denver (30-26) and a game in front of No. 8 New Orleans (29-26). The L.A. Clippers are ninth at 28-26, with the Jazz a game behind them. "I'm disappointed with the loss," Portland coach Terry Stotts said. "You start looking at the standings, and this was a big game." Three weeks ago, Utah was 19-28 and seemingly headed for the draft lottery. With center Rudy Gobert back from a knee injury, Rubio playing some of the best ball of his career and Donovan Mitchell emerging as a Rookie of the Year candidate, the Jazz are back in the playoff picture. "They had a little rough stretch when they kind of dropped out, but at the beginning of the season, everybody had them included," Portland point guard Damian Lillard said. "It's always a tough run for those last spots in the West. No reason why they wouldn't be in it. They have some good players. I don't think anybody's surprised they fought their way back in." Rubio missed the game with a sore hip, but Mitchell slid over from his shooting guard spot to brilliantly run the show. The 6-3 Louisville product scored 21 of his 27 points in the second half, grabbed five offensive rebounds and gave Lillard all he could handle with the ball in his hands. "He should be Rookie of the Year, for sure," said Lillard, who won the award himself in 2012-13. "Not just because of his numbers, but his impact on their team. He is basically leading them. "He is able to get to the rim. He is shooting the ball with ease. He is not afraid to be aggressive. He is a really good player, not just for a rookie." Mitchell wasn't a one-man show. Australian southpaw Joe Ingles bombed in 24 points on 8-for-12 shooting, including 6 for 9 from 3-point range. Derrick Favors (15 points, 11 rebounds) and Gobert (12 points,11 boards) led Utah to a whopping 58-37 rebound advantage. In his first start, rookie Royce O'Neale contributed four points, 11 rebounds and six assists. And Jae Crowder, in his first game in a Utah uniform after a three-team trade, chipped in 15 points and five rebounds off the bench. Utah coach Quin Snyder isn't calling for a parade down South Temple in downtown Salt Lake City. "This is the regular season," he said. "I'm not counting (losses) when we have a losing streak. I'm not counting (wins) when we have a winning streak. No one is taking chalk and putting anything on the board or carving something into a tree. We just need to play basketball. That's what we need to keep doing." Portland, which started the game 2 for 14 from the field, led 44-43 after a sluggish first half. The Jazz busted it open with a sterling third quarter in which they knocked down 8 of 10 from beyond the arc. The Blazers whittled a 25-point deficit early in the fourth quarter to 12 inside the final three minutes, but it was too little, too late. "We had a bad quarter," Lillard said. "We had a let-up. It went from a one-point lead to a 16-point deficit real quick. "(Utah players) got corner 3's. They got to the loose balls. They got second and third opportunities, and we didn't make shots. They did a great job defensively. We needed to be able to get stops and push it at them in transition and not allow them to set up in half-court defense." "Utah played a great game," Stotts said. "It was a defensive first half, and then they got it going in the third quarter with 3's. For the last few weeks, they've shown how good they can be offensively, and they showed that tonight." Lillard, coming off a 50-point performance in Friday's win at Sacramento, scored 39 points, making 12 of 25 shots from the field and 13 of 13 from the line. He was only 2 for 8 from behind the 3-point line, though. CJ McCollum scored 14 of his 22 points in the fourth quarter. Lillard's backcourt running mate was 3 for 14 from the field through three quarters. The Blazers were shooting .328 at that point. They made 13 of 23 shots in the fourth period to bring it up to .407 for the game, but it wasn't nearly enough on a night when Utah shot .466 and made 13 of 26 3-point attempts. "We struggled offensively most of the night," Stotts said. "Credit to (the Jazz) defense. We could have executed better, passed the ball better, taken better care of the ball. But Utah beat us — simple as that." The Jazz grabbed 16 caroms off the offensive glass. "They had a lot of offensive rebounds tonight, but there were a lot of things that caused this loss," said Portland's Ed Davis, who had eight points and 12 rebounds in 29 minutes off the bench. "They beat us all the way around. The better team won tonight. "This was a good test for us, and we failed. But this is the NBA. It's on to the next one. We have to learn from it. We have to be better. If we play well, we know we can beat anybody. We just have to play well." NOTES: The next game for the Blazers is Wednesday night against the defending NBA champion Golden State Warriors at Moda Center. ... Portland center Jusuf Nurkic went scoreless on 0-for-4 shooting and had three rebounds in 14 minutes. Nurkic departed with what was reported as a sore lower back and right hip early in the third quarter and did not return. ... It was the 16th game this season in which Lillard has scored 30 points or more. ... On Friday night at Sacramento, Lillard — who had scored 50 points in 29 minutes and 29 seconds — sat out for the entire fourth quarter of a 118-100 win. McCollum had gone for 50 points in 29:16 in the Blazers' 124-108 romp past Chicago in Jan. 31. Lillard owns the franchise single-game scoring record of 59 points. Lillard, McCollum and Golden State's Klay Thompson are the only players in NBA history to score 50 points in less than 30 minutes. Even with the big lead, did Stotts have any mixed emotions about keeping Lillard out for the final period? "Not when his minutes were at 29:29," Stotts said. "Now, if (Lillard) had been at 31 minutes, I probably would have let him go for 60 (points)." ... Stotts, on why he is using a 10-man rotation rather than employing nine as he usually does: "Evan (Turner) is playing well. Zach (Collins) is playing well. Pat (Connaughton) is playing well. Shabazz (Napier) is playing well. Ed is playing well." Rubio had averaged 18.9 points and 7.6 assists and shot .542 from 3-point range during the Jazz's eight-game win streak. The 6-4 Spaniard, acquired in a trade with Minnesota in the offseason, scored 30 points to lead the Jazz past the Blazers 112-103 in overtime the last time the teams met on Nov. 1 in Portland. "He's playing differently now than he did then," Snyder said. "He has become acclimated to me, to the system and to his teammates. He came directly from playing with Spain's national team last summer and hit the ground running. There's a process that has to occur for a guy to find a comfort level — particularly when you're a player like him, who has the ability to connect others. He has to get connected with them before he can help them connect. And understanding the defensive system. I want him to get steals, but I want him to be disciplined. All those nuances are things that have gradually become less conscious, where he's not having to think about so many things, and he's just playing. There are a lot of things he's working on. Subtle things like shooting a little left-handed scoop shot at the rim. He is shooting it well from 3. He is choosing his shots well. His decisions are good. He is playing with confidence. That's who we think he is."